Interviews: An Interview with Katre lead guitarist, Hasan Koc - Sea of Tranquility - The Web Destination for Progressive Music! 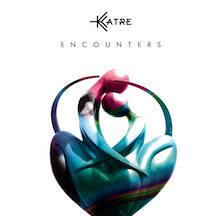 With the release of their latest album Encounters, Turkish act Katre have blended post & symphonic rock with Eastern flavors for a unique instrumental sound that makes them a must hear band for any progressive rock fan. Sea of Tranquility staff writer Mark Antony Rossi recently caught up with guitarist Hasan Koc, who gave some real insight into the creation of the bands music as well as future plans. SoT: The challenge of any instrumental album is to be both lyrical and musical at the same time. It must be doubly difficult to any attempt a concept album entirely instrumental. How this you map out this complex project? There have been a few challenges of course, first of which being "lyrical vs. instrumental" part. I understand the general perception that it is harder to approach the music from the instrumental point of view, when having a subject in mind. For instance, if a friend were to ask my advice whether to include lyrics for talking about a concept in a song or in an album, I think I would say "yes, do include them, because making yourself understood is easier with lyrics". Interestingly, concerning my compositions, I feel myself more comfortable in reflecting a concept without using lyrics. I have the feeling that the lyrics and the semantics behind them may at times bound me, especially when it comes to reflecting the subject of Existence, as the words and sentences are linear. I mean, Existence is something which we do not quite know where it begins and where it ends. Just like the notes that nest in each other and sustain. There is a certain trade off applying text to your music. The lyrics can be so powerful, let you carry out your message with two or three words. In that sense, I must admit that I am not good at writing them. Besides this inability and the beauty of choosing the notes to speak for themselves, there is also a pragmatic aspect of not using the lyrics. Let's assume that we'd write the lyrics in English. This would be a problem for non-English speakers, e.g. for some family members of mine, which would then not understand the results. But now, I feel Encounters comes closer and can contribute more to music's universality. The second challenge was finding the right frame (or "subject under study"), as Existence is an overarching concept. "Do I focus on the very early stages? Do I include the first steps? Should this go until the last breath?". Then I decided to follow, again, a non-linear way and told myself that I do not have to define a begin and end. Instead, I could just focus on the most astonishing parts of this path, e.g. learning new things and curiosity (Tracks 6 & 7), the heartbeats (Track 3), the degree of effort as well as the dedication of the mother (Track 2). At the end, I felt myself a lot comfortable with such an approach. The last challenge was how to make the instruments speak. Let me give you an example. The track called "Bond" sets the beginning of Chapter II, Existing. So, here, I want to focus on this everlasting relationship between a mother and her child; the first time they see, touch and smell each other. How can the instruments mimic that? One way could be using 3 different types of guitars, (acoustic, fretless and electric guitars) and 3 different solos played by them. So, I could represent homogeneity of that bond perceived by different senses. A further example is the opening track. The fetus is surrounded with a protective liquid in the mother's body and what he hears reminds us of what one hears when diving into the water. So, there we have the guitars voicing the sound of an underwater whale and e-bows as a first signal of our approach we followed throughout the album; the continuation of the sound. Overall, the songwriting process was complex, but there was a great relief when I felt everything, both musically and conceptually was in place and aligned. SoT: One can listen to this album and distinctly hear the eastern and western influences working in harmony for the greater good. What in your background gave you so much exposure to systems of music completely set apart from each other? The band members have been raised in Turkey, which consists a huge cultural mosaic inherited from its rich history. There are Jews, Christians, Muslims, Atheists and other minorities with roots in Syria, Bulgaria, Albania, Georgia and many more. The possible mix of such different groups result in a diversification, although the current president aims at creating "one nation, one language, one religion" (which, by the way, we won't let). Music is one domain, where you can find the instantiations of this colorful variation. I am coming from a musical family and have been (and still being) exposed to the Anatolian music system. They are distinguished by the utilization of this makam system, which allows for a unique intervallic structure in the songs. So, let's take this as one ingredient. The western influences are caused by the attempt of creating a micro cosmos in Turkey. This is something I needed, both on a personal and social level. As a member of a minority group, which do not necessarily believe in Islamic practices, such a micro cosmos served both as a shelter from dogmatism and established an area, where I could flourish myself (and I think this also applies to other band members, as far as I know them). So, with twelve, I was turned on to rock and heavy metal music, basically first by Nirvana and Metallica, followed by Sepultura, Slayer etc. I walked the path that each metal fan did I guess, explored the more extreme parts of metal music, e.g. black, death & thrash metal. After a while, I heard "Death" (death metal band from Florida) and was blown away by Chuck Schuldiner's understanding of the music. I had discovered the progressive metal and the idea of syncopated playing. Then came the bands such as Dream Theater, one of my all-time favorites, or more melancholic and melody-driven ones, such as Porcupine Tree and Steven Wilson. , when singing or playing their songs, I was trying out some makam systems on them, you know? At first, it felt funny and we were all laughing. But there was some magic in bringing those two worlds together. I mean, I am not the first one doing this, there are prominent bands in Turkey that apply such ideas (for an academic analysis of it, I can refer the readers to an academic essay of Ilgın Ayık � Pentagram (a.k.a. Mezarkabul): Founders of Turkish Heavy Metal). But in the post-rock context, I have never heard of something like this, which allowed us to experiment with the sound during song-writing and recording process. SoT: Do you play traditional eastern musical instruments on this album? And can you briefly explain what they are and the types of tones each permit? There is one instrument on this album which, through its utilization, can be classified as an eastern instrument and this is the fretless guitar. So maybe it might be better to say that our approach to the fretless guitar is something eastern, rather than the instrument itself. The fretless guitar, as the name implies, has no frets and this allows you to use the intervals I mentioned earlier as well as to incorporate commas. I do not have enough information about music theory, but I think it is fair to argue that one encounters commas more in the eastern than western music culture. Removing the frets relaxes the limits that a guitar is bound to and increases the number of applicable notes. Hence, it allows us to reach this eternity, which is in line with the concept of Existence. We used two types of fretless guitars in the album; the classical and the electric fretless guitars. We combined the latter with an e-bow and mimicked a Ney (reed-pipe), which is a classical instrument in Turkish music. The former one, the classical fretless guitar, was invented invented by Erkan Oğur, a worldwide recognized musician. Luckily for us, this wonderful musician (and personality) contributed to the album's opening track, where he demonstrates the integration of commas to rock music in an excellent and unique way. So, a dream came true for us, since we highly respect and learn from him. Due to the health issues, I could not make it to İstanbul during the recording sessions and thus did not get to know him in person, which would be anyway so hard for me as I do not know how to express my admiration and respect to him in words. SoT: I've been to Turkey while in the US Air Force and enjoyed my historic travels and friendly population. Yet I had never encountered a rock environment. Have times changed to allow rock and rock and western music shows? In my opinion, it is possible to find rock and metal scenes throughout the Middle East as in any region of the world. Nowadays I am reading "Metal Rules the Globe: Heavy Metal Music around the World" (Ed. by Jeremy Wallach, Harris M. Berger, and Paul D. Greene. Duke University Press, Durham, NC, and London, 2011, ISBN 978-0-8223-4733-0), which is a collection of academic essays on heavy metal around the world. There I see examples of practicing metal music in Nepal, Indonesia, Malaysia etc. But I think the reason that you did not encounter a rock environment is that the Turkish public perceived rock music, its culture and, any subculture, as a potential threat to its morality concepts. There was even a satanic panic created by the mass media during late 90's; many people wearing black shirts, having beards or long hairs have been harassed in different forms. Combining this with the high import taxes and the decreasing of purchasing power, many metalheads, including myself relied on informal networks to access the albums, magazines etc. I am not saying we were hiding our musical tastes, but we were aware that we had to be "careful" and rather not catch the public attention. As in other parts of the world and Keith Kahn-Harris in Extreme Metal: Music and Culture on the Edge has already pointed out, we were engaged in the activities of the metal underground, such as tape trading and exchanging letters with bands, bistros and other members of the underground scene. With the advent of the Internet and technical innovations, everything became way easier. I mean, I left Turkey in 2010 but I still can observe what is going on in terms of the rock environment. Due to lowered costs, the bands can afford putting up a demo or an album, they can transmit digital audio and video files to the production companies; the fans follow the bands via social media and at times get to interact with them. High taxes and the purchasing power still seems to be the biggest problem though; the promoters for instance cannot afford booking bands that have a huge fan base in Turkey. But when they do, the fans usually fill the venues, which is often surprisingly positive for the international bands. In Europe, the bands are used to playing to 100 to 1000 fans in a gig (except for bigger names and festivals). The fans have the possibility to catch the band in two or three years of time, so they are rather cooler during the stage performance. But in Turkey, you'd know that you as a fan would not see this band that often (or maybe it is the first and last time you see them), so you give everything you have, the crowd goes wild and the numbers double. Hence, the reaction of fans towards the band is I guess more vivacious. Yes, to sum it up, I can say that rock music has a long tradition in Turkey and from a sociological point of view, it is in line with Turkey's Kemalist worldview. A wonderful essay analyzing this phenomenon is written by Pierre Hecker's Heavy Metal in a Muslim Context: The Rise of the Turkish Metal Underground. SoT: Ironically, having no vocals means you don't have to concern yourself with being wed to any language since music is a universe language all its own. Have you encountered this phenomenon while playing to live crowds? We have not yet played live; unfortunately, we were too late for most festivals' 2017 editions. Though, the feedback we got from the organizers was pretty good and we agreed that we'd submit for the forthcoming editions. Furthermore, we are currently in talks with booking agencies to organize many gigs, but right now I cannot say more than that. Hypothetically, and as a scene member who has been involved in many gigs without vocalists, I tend to think that being an instrumental band makes it to a small extent easier to connect with the crowds. Because, as you say, the object of transmission is the instrument itself, which is universal� and when the band uses the instruments, the crowd seems to be more aware of what is going on, they kind of observe more. On the other hand, I have also encountered quite many cases, where the crowds sing along the vocal lines as the song continues, whereas they do not quite know the lyrics but instead define "their own". In such examples, it is basically melodies (instead words) what the fans are reflecting. So, it is fair to argue that the melodies are the common denominator when playing live. SoT: What are the musical influences, eastern and western, that drive you to create this original blend of meeting of geographic hemispheres? I would love to begin with eastern influences. Obviously, the first one is Erkan Oğur, as he is not only a talented musician, but also a philosopher to me. 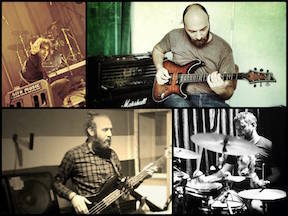 There is also Cenk Erdoğan, who is a magnificent fretless guitar player; I learn a lot from him. In terms of rock, I could mention Pentagram, Yaşar Kurt, Bulutsuzluk �zlemi and Kurban, from which I got the touch of "turkishness in rock music". Western side of the blend�Hmm, the list is huge I guess. Apart from the bands I mentioned above, I would say Russian Circles, ISIS, Sigur Ros, Mogwai from the post-metal/rock edge, Tool, Pain of Salvation, Opeth, and Tesseract from the progressive metal edge have an influence. Currently I have been listening to Soen, Dumbsaint, Meniscus and Toska, all of which are also influential. SoT: I noticed Vangelis often includes a vocal track on his almost entirely instrumental albums. Have you ever considered including a vocal track on a song or two? In Katre's practice sessions (which occurs maybe once in a year as we are spread to three different countries), sometimes I feel like I should just sing a note; not necessarily a sentence or a word, but just the note itself. It is in line with what I've just stated about the "common denominator" in music. I am curious as to whether I can cent wise play with that note and mimic a fretless guitar or a ney. So, it seems like we will be running some experiments about that in the future. On the other hand, I sometimes feel like I could use some high-pitched screams or even guttural vocals at certain parts of the songs, which we rehearse for our next release. Yet, I do not think that we will adopt such an approach and this feeling is only temporary. Finally, without naming names, there are a few strong voices in rock music we all four admire, whom we'd very much like to include in our next release as a guest appearance.